While the year 2000 marked the beginning of a new millennium, looking back it marked the beginning of a unique falconry era for me. With an aging hawking team, the arrival of an irish red setter dog puppy and an eyas peales x peregrinus falcon was not simply a just in time situation, but their abilities as they quickly matured were to improve my general falconry field standards. These two arrivals were the class of 2000. The Irish red Setter, as bred by Jenny & Tony Crosswell, and was one of six puppies in the litter. My selection of litter was based on the fact that both Jenny & Tony know what they are talking about when it comes to all things breeding and genetics, as well as the fact that they had tried to remain true to the Moanruad line of working Irish Setters as established and made famous by the late John Nash. With this particular litter, the outcome was even more special as the sire was (the now legendary) Ardoon Jack as bred by the late Will Sloan and as owned & field trialled by Steve Robinson. On our initial visit the pups were three weeks old and my wife and son selected the smallest dog pup. Collection was five weeks later when my eldest daughter joined me and it was on that journey south that we elected to drop the K-name theme (as previously associated with all our dogs) and to have the dog names synchronised with the falcons in having an M-theme name. No bad thing, though I do believe Jenny & Tony winced at our apparent lack of imagination when we announced the dog pup was to be named Murphy. On the return leg of that same journey my daughter and I visited Ian Garland to view the eyas falcons of the year. With Troy still requiring another month to complete his thirteenth moult I was in no hurry to pick him up and so this visit was to select an eyas for the 2000-2001 season. And it was I was captivated by three eyas falcons, that were by coincidence all half-peales with regard their breeding. I expressed an interest in the smallest eyas, though Ian allowed me to make that final decision at collection. That decision did not change and the falcon was named Mariah, after the attractive-looking diva with a unique vocal talent to hit ultra high pitches. The season started in fine style with both class mates displaying much potential. That season was mixed in terms of weather and it was not until late November that the weather settled down to enable quality hawking. The young setter Murphy surprised more than a few falconers in displaying a pointing ability at an early age, while his energy and running had others re-shaping their opinions of the Irish red Setter. Meanwhile Mariah was starting to use the sky, though pitches varied in the modest 350-500’ range in the lead up to year end. However her style was consistently improving through diary records remind me that she was very checky, even as far in as late November. December brought a high pressure weather system and that allowed Mariah to put the finishing touches on her flying style as she discovered thermals and the advantage of improved pitch. While there were no cigar moments, those flights underlined my belief that she would assume Troy’s #1 position on the cadge. That same season was also to provide Mariah with an understanding that she was not the only predator around and a number of lowland episodes educated her with regard the dangers of buzzards. The season was a big push season as I had elected to leave Troy in the aviary. At 14 years of age he had done everything and more for me in terms of field performances and his age showed through in the previous season. As such I decided to retire him to while away his remaining days courting young falcons. During that same season and as blessed with great longwing weather, Mariah raised the bar to deliver consistent and improved upon high pitches. While her footing was slow to improve, it was her determination to remount to similarly high pitches that had me in awe. In doing so her performances would be toned down should I opt for daily flights. Given all she was doing I decided to fly her every alternate day and this brought about consistent four-figure pitches during December. The outcome of all this was that I witnessed the best lowland falcon performances in many a long year. A number of buzzard interaction scenarios also furthered her education with regard my role, as her falconer, in the proceedings. As such she would freeze when on a kill, should she sense any raptor in the vicinity. And there she would remain till I entered into her vision, whereupon she would chup and call to me before commencing pluming and eating. Mariah was flying with energy, strength and confidence and so we journeyed down to the midlands in early January 2002. However on that occasion the fog rolled in as the high pressure gave way to warmer weather and no flying occurred. In the previous season Mariah had developed a vice in terms of chewing the right hand jess. That vice became a deep rooted habit during the 2001 season that had me transition from kangaroo jesses to parachute cord jesses. This was a necessity as sometimes she’d chewed the button off in an hour or less, to thereafter sit content on her block. Murphy on the other hand, with his love of running, game sense and easy field management had me wishing I had transitioned to this bred a long time ago. As such he was awarded the #1 dog spot and with another setter puppy in the kennel, Kerry (the aging GWP) was offered some respite. The season was a little indifferent in that Mariah was inconsistent at best and as such I saw only a few glimpses of her 2001 performances. However that same year the weather was not as ideal for quality hawking and my morning schedules were tight. One incident remains etched in my mind however; it was a crisp morning and a covey of greys were spotted in an ideal location. Ever vigilant re fences lines and buzzards, the set-up looked good. As Mariah completed her aerial ascent, I ran in to flush the game birds. Down she came, bound to the lead bird, set her wings to land shortly thereafter. Upon dispatching her quarry, I literally saw a distant tree come alive as seven buzzards took off to all glide in towards her. I ran as fast as I could, but these broad wing devils, appetites no doubt sharpened by the overnight low temperatures, were totally unaware of me. With perhaps 400yards to run, the buzzards arrived to circle Mariah; some of them electing to jump up and down as if to un-nerve her and so force her to depart and leave her kill. However she stood her ground and cacked like an angry mother falcon when I arrived, leaving me in no doubt she had neither appreciated the delay in my arrival nor my sprinting efforts! The season was even more disappointing as Mariah was in poor health upon her collection in late July, with her aviary exit weight being ~28% below previous moulting exit weights. I can still recall how poorly she looked upon collection re dull eye, loss of body condition, loss of cere/foot colour and loss of feather bloom. Yet in spite of numerous mute samples and a blood test, nothing showed up. As such tender loving care and with a supply of quality, freshly killed quail (courtesy of fellow falconer Mike Butterworth) she slowly recovered. However this was a set-back and as such hawking that year did not commence till mid October; and it was further two months before her brilliance began to shine through once more. As such January saw me once again witnessing super four-figure pitches with absolutely massive out-runs being taken. On many an occasion I would see her melt into the sky when about 1.5 to 2miles miles out. At those times I’d glance at my watch and time her return; and that could be as long as seven minutes before she appeared back overhead. These breathtaking pitches and awesome stoops still had few cigar moments in terms of successful outcomes, but the flight aesthetics were simply the business. Murphy continued to be #1 dog, though another similarly bred young dog (Mitchy) was beginning to show promise. With this I made a decision to release Morgan, the 2001 puppy and progress accordingly. My eagerness to start the season resulted in Mariah being lost on her first flight. It was my own fault and over-enthusiasm, but at least it did demonstrate that Mariah’s health was good. Gales came in during September and October and they in conjunction with a heavy workload curtailed my field activities somewhat. As such I was less than prepared when the BFC international meet came along in early November. Mariah had not flown for the previous week prior to the meet and while she did put in show, it was a well below par performance. However the teams’ credibility rating was probably saved by the setters’ field performances, with Murphy gaining most of the plaudits for his text book running. Mariah’s flying was consistent and high during remainder of November and December, though Boxing Day marked the end of a short season as the weather turned truly foul with long-lasting, severe gales. The season did not truly get started till mid November when a prolonged high, cold pressure came in to rest over much of the UK to provide idyllic longwing conditions. The flying up till then had been nothing startling with weekday hawking being limited due to a supposed case of bird flu on the east coast of Scotland. As a result I had elected not to fly ducks as I simply did not want to run the risk of cross infection. While partridges and pheasants are fine, ducks are a tremendous lowland quarry for those falconers desiring to instil game appreciation to their feathered companions. The winter high pressure brought about the return of the big pitches, though it was the early morning upland pitches that had me testing my resolve. While I had gotten used to Mariah disappearing only to return on high, the time difference was somewhat lengthened this season around. Gone was the standard seven minute wait to be replaced by ten and sometimes twelve agonising minute waits. Though the telemetry informed me all was well, I am of the belief she was searching for thermals. I am unsure if she ever found these, though regardless the pitches were extremely impressive and accordingly the stoops were absolutely sizzling. That high weather pressure stayed with us till late January and as a result a lot of hawking was undertaken, though more importantly a lot of quality hawking was observed. My field diary records indicate that 80% of game taken that season was from ultra four-figure pitches, while diary entries further indicate that she had a 17 flight run of success on lowland and upland game during December & January. 2005 was truly a vintage season. Egged on my fellow falconers re Mariahs’ 2005 season ultra pitches, my new field toy was an altimeter to assess how close my previous pitch estimates had been. I started the season quite late as my wife and we travelled to Ireland to spectate at the pointer & setter championship. As such our season did not truly start in earnest till September and even then that start was somewhat interrupted as I badly sprained my ankle (retrieving an errant eyas after dark). As such field activities were lowland centric for a few weeks. However September, after the driest summer for many a long year, brought the rain and the ducks. Just as the season started to produce some quality flights, my falconry season stuttered and started to fall apart. Murphy took ill and passed away. While still left with two setters, his pointing accuracy and field abilities (especially his game intelligence when assisting with flushing ducks off the river) were going to be sorely missed. However we pressed on and the high pitch flights continued during the good weather of October, though one particular outing stands out. It had been a wonderful afternoon in the company of a friend, running our dogs on the moor in search of the perfect grouse set-up for my two falcons. While points were obtained, they didn’t offer me what I wanted in terms of a set-up desired. Then while running my young setter Marty, a good set-up soon presented itself. Mariah was duely un-hooded, de-jessed and off and up she went. Flush instructed and a single snipe was produced. Given Mariah doesn’t do snipe these days, she took a big outrun to get more height. With that we elected to run my friends’ young pointer in a brace situation to try and produce something. Off the dogs went in either direction and after a couple of cuts of the ground my friend’s young pointer came on point. While he went to manage the young setter, I moved towards the pointer. Mariah centred on the situation and the flush was instructed. A small covey of red legs rose and down she came in a classic teardrop shape to pound one and knock it to the ground. Throwing up and looking over her shoulder, she obviously could not see the partridge and so carried on flying to take in lots of the sky. The sun was falling and all too soon she melted into the tequila coloured horizon. Meanwhile Marty continued to hold his point. At just over twelve months of age the young setter was showing a lot of promise, though would be used sparingly this season to ensure his training manners did not deteriorate. The minutes passed and eventually I pulled out the telemetry, though it simply indicated that Mariah was out there, up there and still flying. Then perhaps nine minutes later she was back overhead at another magnificent four figure pitch. After centre’ing on the ground activity, I moved in and instructed the flush. Grouse up and down she came. Pumping with intent, desiring to fall faster through the still air. The grouse flew like jets in a close formation over the mixed heather and white grass upland. As the covey fast approached a small brook they elected to take a left swing to avoid crossing. Mariah had now bottomed out and made her final move. That left-swing grouse manoeuvre resulted in her being able to move into a pole position and take out a bird. Two game-birds had been taken in a single flight; yet the flight had produced two very different stooping styles, as deserving of the quarries. In all immensely satisfying. Mariah was in a groove, though two back-to-back early November incidents had me questioning my management practices. It all started with an early morning flight on partridges and was supposed to be a milk run to allow me to reach the office and chair an early morning meeting. A strata’ed, cumulus cloud sky made it difficult to track Mariah’s whereabouts once she was distant from me. However after seven minutes, I spotted her about three-quarters of a mile out and still climbing. She was fast approaching her lowland four figure pitch and with that I reckoned another couple of minutes before she’d be overhead. Just then I noted some ducks taking to the air to head westwards. They were in her “killing cone” and I thought I noted Mariah commence a stoop, but lost all visibility thereafter. ~45minutes later I tracked her about a mile away to find her breaking into a crow! This was the first check she had ever caught and so began to dread (as a few falconer friends shall attest to re my subsequent ranting behaviour) the next few flights. Just whatever happened to the ducks ! Next day out the weather was less kind and slightly blustery. A point had been established and it looked good. As Mariah mounted with intent, an adult peregrine came in to challenge her, though she blew it away with all her focus being on the sky above. At 700-750’ and still climbing like a demon, this was looking good. I started to move forward towards Mitchy who was holding point ahead and as I approached I looked skywards to ascertain Mariah’s position. As she was nowhere to be seen the telemetry was brought out and informed of a signal off to the south-east and fading. What was going on! 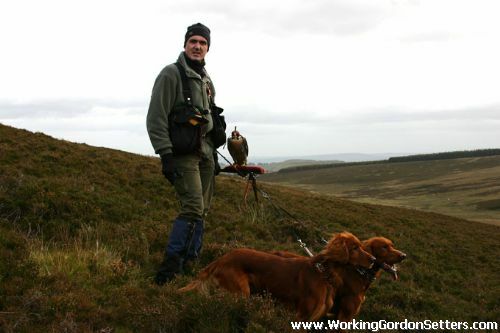 Dog was instructed to flush and produced a covey of five grouse; thereafter we headed off in search of the truant. About an hour later, having walked over some difficult, tussocky upland ground, she came into the lure. While I was grateful of a no kill situation, I suspected she had chased a hill crow. To avoid further episodes of the same, I reduced her weight just a little to sharpen focus, though this did dent her pitches. As such it was not till late November till she was back and on form again. During December high winds from the south west battered the UK, while easing off on very occasional days that permitted quality falconry, the foul weather making game birds scarce on my lowland patch. With Christmas approaching, and having not flown for 5 days, I accepted a long-outstanding invitation to fly wigeon. The set-up looked ideal and with that Mariah was released. She climbed like I expected her to given her idleness these past few days, by remaining relatively tight and climbing steeply on the light air. Setting her sails upon reaching a quality four-figure pitch, I removed the altimeter from my pocket to ascertain her pitch. With a smile, I displayed to the estate manager before dropping into a drainage ditch and heading to the south end of the pond. Mariah knew the script and was already in position by the time I arrived. Ducks up and she turned over to pump her way into a stoop. She knew the quarry, she knew what to do and continued to pump through the descent, while occasionally adjusting her flight path. Falling headlong and heading in a north-westerly direction, it seemed like an age before she bottomed out to intersect with the flock. With the target long identified, she rushed in and bound to the lead wigeon, making it appear all too easy. Still smiling, I watched as she set her sails and cut her speed, while looking around for her dining table. Much rain had fallen over the past two to three weeks and as a result a sizeable splash had formed at the far end of the pasture. Heading for that area, Mariah adjusted her wings to take her over the low cut beech hedge so as to avoid the splash zone. Then just as she cleared the hedge, a small truck came into view. The previous feelings of pre-flight tension, flight excitement and inner satisfaction and delight with her performance and success were all too soon flooded with wave, after wave, after emotional wave of loss, sorrow, heartfelt emptiness and disbelief. 2000 was indeed the beginning of a unique falconry era. Looking back I never could have predicted the impact that both Murphy and Mariah would have on my falconry experiences as well as my life in general. 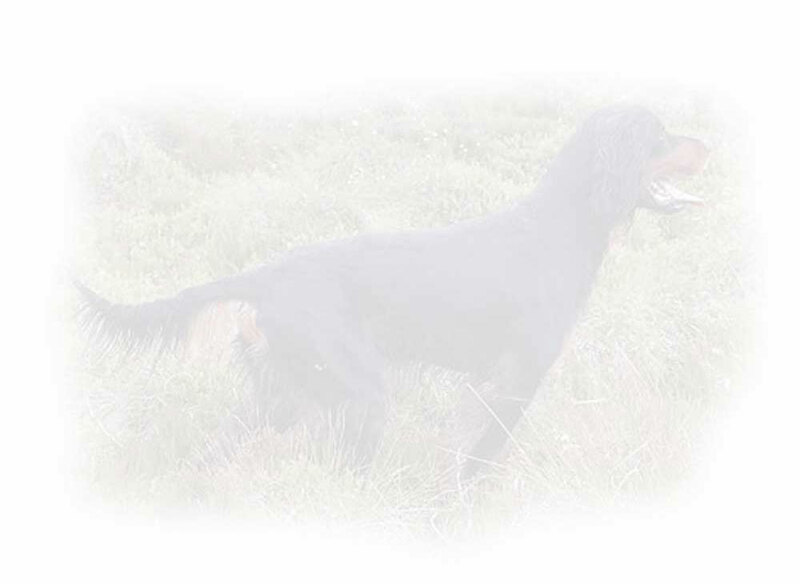 Murphy was our first irish red setter, had a delightful and lovable nature, yet was a terrific bird dog. He was our re-introduction to the field trial scene and shall always be fondly remembered. While a number of reds have and shall follow in his foot-steps, I doubt if he shall ever be toppled from the top of the leader-board in terms of game intelligence. As for Mariah, I still feel sorrow. When flying her, my heartbeat always quickened as she left the fist, anxiety always set in when her outruns extended beyond my vision, elation always filled me when she was back overhead at a towering pitch and immense satisfaction always filled me as she stooped earthwards. Unfortunately she never bred, though leaves me with many memories of wonderful times. I have been fortunate enough to have flown four great gamehawks in the past 20 years, two of which I regard as being exceptional. Mariah was one of those exceptional performers, who (like her name-sake) had a natural ability to achieve ultra high pitches. I’ll miss the bond that existed between us, though it shall be her passion for such dramatic, high flying that shall have me yearning for many a year to come. While hard to admit, it almost seems fitting that both class-mates departed in the same season. It was therefore appropriate to bury them beside one other on a heathery, south facing knoll on the moor where both had put in many, many top-drawer field performances. Murphy and Mariah were my class of 2000 and they shall be forever remembered. May they now both rest in peace. Farewell and god-speed.